If you know the history well or just adore the French culture and everything that is related to it, then you are aware that yesterday, France celebrated one of the biggest national holidays - Bastille Day. And taking into consideration the fact that the upcoming game in Assassin’s Creed series is related to the events of 14th July 1789, it’s not surprising at all that Ubisoft has decided to present us the fresh Assassin’s Creed Unity videos, dedicated to this historically important period of time. Thus, the first Assassin’s Creed Unity trailer is a gameplay video, where the story is beimg told by the forthcoming game’s protagonist - Arno. He is telling us about the difficult life of his nation, who is suffering from the hunger, the social inequality and various persecutions. Somebody has to make a stand for the oppressed citizens, and this person, as you have already understood, is the main game’s character. Besides the project’s story line, new Assassin’s Creed Unity video demonstrates what awaits you in the upcoming action-adventure, so we strongly advise you to watch it right now. The second Assassin’s Creed Unity trailer is completely dedicated to the historical part of the game, or to be more exact, to the events, which led to the beginning of the French Revolution. So if you want to plunge into this epoch in the France history (i.e. 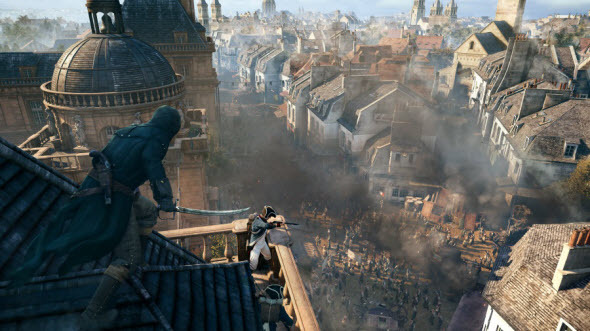 1789 - 1799), then we suggest you checking out the fresh Assassin’s Creed Unity video, published below. And the last thing, which we would like to show you today, is two new game’s screenshots. Enjoy! Let us remind you that Assassin’s Creed Unity game will hit the stores at the end of October on the next-gen consoles and PC.